A wedding cake is the traditional cake served at wedding receptions following dinner. In some parts of England, the wedding cake is served at a wedding breakfast; the ‘wedding breakfast’ does not mean the meal will be held in the morning, but at a time following the ceremony on the same day. In modern Western culture, the cake is usually on display and served to guests at the reception. Traditionally, wedding cakes were made to bring good luck to all guests and the couple. Modernly however, they are more of a centerpiece to the wedding and are not always even served to the guests. 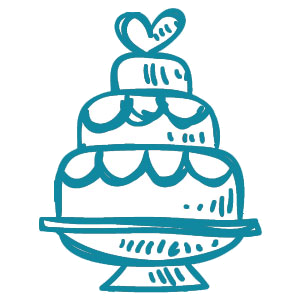 Some cakes are built with only a single edible tier for the bride and groom to share, but this is rare since the cost difference between fake and real tiers is minimal.